People in chronic pain need help, more options, more understanding. A Blueprint for Transforming Prevention, Care, Education, and Research] Issued at the request of Congress as part of President Obama’s health reform legislation, the report calls for a “cultural transformation” — an attitude shift on the level of that seen over the last 50 years toward smoking — to spur more coordinated action to help treat Americans’ pain. Pain patients have long been viewed with skepticism and suspicion, rather than understanding, presenting a barrier to care. Rising rates of prescription drug misuse, addiction and overdose have further led to the establishment of legal and regulatory barriers, such as prescription databases, that can prevent even legitimate pain patients from getting much-needed drugs. It seems Congress is not on the side of transforming the way we help people in pain, they’re on the side of the “skepticism and suspicion” and “legal and regulatory barriers,” not to mention the fear mongering over pain medications. Last month, my Senator, Chuck Schumer made local TV news headlines ranting, not just about abuse of prescription drugs, but “Rails Against FDA Testing Of Super-Potent Painkillers” as NY1’s headline blared atop their story at www.ny1.com. He doesn’t even want these new medications—extra-strong meds that pharmaceutical companies have created to help people in real pain—to be tested and approved for legal prescription and sale by the FDA for fear of abuse. He’s even saying that FDA approval of new pain meds will “add fuel to the fire” of crime and lead to increased robberies, playing up the recent armed raids for oxy and vicodin at two Long Island pharmacies. Absolutely the height of alarmist rhetoric here. has evidently always been a “tough on crime”-type of politician, a key supporter of the Violent Crime Control and Law Enforcement Act of 1994 (VCCLEA) that instituted a federal “three strikes and you’re out” life-imprisonment policy, and since the attacks on 9/11, he’s become a big “tough on terrorism”-type of politician. For example, last May, Senator Schumer similarly made the local news across New York State with his plan for a security crackdown on trains, especially pertinent to New York because New Yorkers are some of the train-ridingest people on the continent. 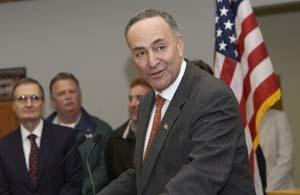 See: Schumer calls for ‘do not ride’ list for Amtrak – NEWS10 ABC: Albany, New York News. These are the kind of headlines Schumer gets. People concerned about unnecessary, Fourth Amendment-crushing, possibly gropey, searches every time you board a train, including me, complained online. His camera-hogging ways, I get it. Salon called him a “incorrigible publicity hound,” and that’s ok. Be what you are, man. Embrace it. But this time “going too far” is especially “too far” because it could accidentally hurt people with chronic pain who are already hurting. Sen Schumer: ‘Super Painkillers Could Lead To Violent Robberies’ « CBS New York possibly the fear mongeriest headline of the year, though it does present an alternative viewpoint in the video report if not the text summary. Senator Charles Schumer warns FDA on danger of new painkillers | 7online.com (WABC-TV, the ABC affiliate for NYC.) Watch the video report embedded below, doesn’t provide an alternative viewpoint! Only one of these scary headlines includes a balancing, alternate viewpoint within. That’s their most egregious journalistic failure: they only give audiences the scare monger’s viewpoint, they only offer shock words. First, they are leaving out important context like these are MEDICINES for people in real pain. The context and tone treats painkillers as no different than street drugs, omitting the therapeutic intent and quality of life benefits (very real.) Note the language used by the ABC-7 reporter Lucy Yang, the term “the streets“ repeated twice. “At least one [pharmaceutical company] is past the lab stage and now trying to get this super-drug on the streets by next year.” “Of course, before any such narcotic could hit the streets it would have to be approved by the FDA.” Stopping just short of calling pharmaceutical manufacturers street pushers, there. Second, why do all these reports reference the robberies on Long Island? I disagree that the all-too-common oxy and vicodin hold-ups (which are AWFUL, I don’t want to minimize that) would be effected either way whether the FDA approves new narcotics or not. They are linking two completely unrelated stories, echoing Senator Schumer, for shock effect. Journalists should be questioning the Congress critters, holding their feet to the fire, not mindlessly parroting their press releases. Tying past narcotics violence to the unrelated matter of future possible FDA approval of new narcotics seems like pure fear mongering to me. Third, a look at Schumer’s own language: “the very same people who try to get our kids to use things like oxycodone and vicodin will start peddling this drug, which when abused is poison.” “It would instantly become the most sought-after drug by addicts and criminals.” From the CBSTV-2 story, Schumer said: “Crooks like Oxycontin and Vicodin, yet you leave the doctor’s office, the dentist’s office, the oral surgeon’s office after you have a root canal, they routinely give you 20 to 30 of these pills. That can’t happen with these new powerful drugs.” He’s simultaneously condemning new drugs and old drugs, and nearly finger-wagging at the whole concept of treating post-surgical pain with narcotics. Wow. The drug in question, according to the CBS channel 2 video report, is Zohydro. Zohydro is hydrocodone like Vicodin, Lortab and Lorset is, but it’s the first long-acting timed-release capsule hydrocodone created. I have chronic pain; I can’t take any of the time release stuff. However, I know numerous people who could benefit from Zohydro and other new medications. This could be a miracle drug for people who’re allergic to—or for whatever reason can’t use—the only other time release painkiller out there, Oxycontin. I’m sure that, for many, this could be a life-changing medicine; long-acting squelching pain, giving people with chronic pain their quality of life back, liberating them to get out of bed. You don’t see that side of the argument on TV, but the benefits of effective pain management are huge, and important. People can build up a tolerance to pain meds like bacteria can become resistant to antibiotics, and like humans need new antibiotics, humans need new painkillers. We need new pain meds developed and approved for prescription use. People in chronic pain need more options. Zohydro is also a good step because it isn’t packed with liver-killing acetaminophen that is so commonly combined with opiates. I reported before on the FDA’s bizarre regulation making opioid-acetaminophen combination meds easier to get than purer alternatives because they figure if people know it can destroy their liver they won’t abuse it. This insanity has led to too many deaths, tragedies, and liver transplants, so the FDA itself has been reconsidering recently. I’m saying consider another perspective (which the media won’t give you). Medication mostly does have a big positive impact. Don’t block or take away pain meds that are giving people quality of life. Timely access to controlled medications also continues to be a challenge in the long-term care setting due to drug shortages and what some consider excessively strict federal regulations. “The Drug Enforcement Agency’s interpretation of the Controlled Substances Act is one barrier that’s impeding timely access to appropriate controlled medications for nursing facility residents and those enrolled in hospice programs,” notes Jennifer Hardesty, PharmD, FASCP, clinical services manager for Remedi SeniorCare. There is no question that pain’s effects on quality of life are far-reaching. Not only does pain diminish pleasure and interfere with social relationships and one’s ability to stay active, it is also linked to other debilitating conditions, such as depression and anxiety. In the New York metro area, there’s been an oxy crime wave; it has led to a law enforcement crackdown. Doctors are more reticent to prescribe. Visible DEA enforcement actions have created a very real chilling effect that is making it harder for those already having a hard time with chronic pain. I have nothing against Senator Schumer as a person, I’m sure he’s a great, affable guy, and I’d love to meet him to work on bringing individualized funding, choice and competition to Medicaid/Medicare instead of “one size fits all.” I’m just saying let’s not accidentally snag people in real pain in the “war on drugs” dragnet, let’s be level-headed, let’s not fear monger. All I’m asking, Senator, is please live up to your reputation as a committed fighter for the “common good,” include ailing constituents with chronic pain in that common good, and please be “far-sighted” about how federal drug policy can impact the quality of life of the elderly, the terminally and chronically ill, and disabled populations who live with the most severe pain. I’m on Tylenol 3 with codeine. I’ve used it daily since the horrifyingly botched L-rods surgery in 1991 left me in serious pain. I try not to complain, and keep taking the codeine on my schedule to keep the persistent metal-on-bone pain under control. I’ve been reluctant to go to heavier narcotics, and when they put me on methadone in ’93, I would fall asleep in front of friends and family. Bad idea. You would be surprised that the danger is less the opiates, as humans have been eating opium plants for tens of thousands of years. The danger is from the acetaminophen. It’s toxic to the liver. Question 7: Do you recommend eliminating the prescription acetaminophen combination products? This has been interpreted and widely reported as “FDA advisers vote to take Vicodin, Percocet off market.” Thanks for the misleading reporting CNN! You’ve freaked out patients and raised serious concerns among doctors. Yes, Percocet and Vicodin (the most commonly prescribed drug in the United States) are narcotic-acetaminophen combinations, but that doesn’t mean they’ll be gone; they could re-introduce them without the useless acetaminophen, perhaps renamed. Or do absolutely nothing about the excessive acetaminophen problem and as of May 2015 it seems jack squat has changed on this issue. Up until now, the FDA has prohibited Hydrocodone (the opiate in Vicodin), from being sold in the United States *unless* it is combined with another drug as a compound – far and away, Acetaminophen being the most popular (and most dangerous). The question is why did the government insist that, unlike the more powerful opiate Oxycodone (which is available standalone, as Oxycontin), Hydrocodone not be prescribed by itself? From my amateur research around the net, the answer seems to be some unusually sinister legislation originating from The War On Drugs. In some patients, Hydrocodone can be habit-forming, and its a popular drug of abuse. The FDA wanted to make sure there was something else in the drug that people *wouldn’t* want to take too much of to discourage abuse. Its been known since 1970’s that too much Acetaminophen causes the unwanted side effects such as stomach upset and liver damage. So the FDA figured if that was in there too, people wouldn’t want to take too much of it. Basically, for all intents and purposes, the FDA made an important and popular drug more harmful to discourage abuse. Many Vicodin users and addicts likely have no idea whatsoever that the government put Acetaminophen in there in the first place, nor what the reason and consequences of the Acetaminophen component are. In other words, instead of being dissuaded from abusing the drug as intended, most Vicodin users were likely just thoughtlessly destroying their liver. The government needs to rethink this absurd and harmful policy. The large amounts of acetaminophen consumed incidentally by chronic pain patients like me who take a lot of “compound” medication has (at best) marginal clinical value, and carries unreasonable risks. I’ve never benefited from mass quantities of acetaminophen. It’s easy enough to strip the acetaminophen from these meds, leaving only the opioids, and doing so won’t harm anyone. In my opinion, that’s seriously overdue. The FDA should act, though the narrow vote on this particular recommendation leaves that uncertain.